Roti means bread in Malay and Roti Canai or Roti Prata is a crispy flat and puff bread, it is an Indian influenced food widely found in Malaysia and Singapore. 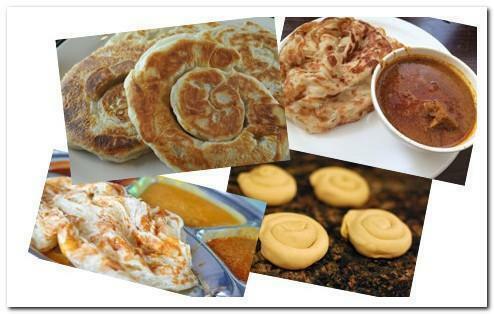 The making process of Roti Canai is very interesting (Tossing and spinning, watch video.). It always serves hot with curry. The curry can be chicken curry, fish curry or bean curry. But some people serve it with white sugar. Knead flour and ghee with water or milk (add a little at a time) until becomes a soft, smooth and elastic dough. Put dough in an oiled bowl, cover with plastic wrap and let it rest for 2-3 hours. Oiled your hand and rolling pin. Grease a clean working surface. Working with one ball at a time. Flatten each ball with a rolling pin as thin as you can. You can pull the edge of the dough until the maximum and the dough become very thin and you can see through it. If it has some holes, it is no worry. Continue pressing it until the size and thickness desired. Pan fry in a greased pan over medium-high heat for 1 – 2 minutes each side or until puffed and golden brown. Serve warm with curry, sambal chili, sugar, sweetened condensed milk or honey.